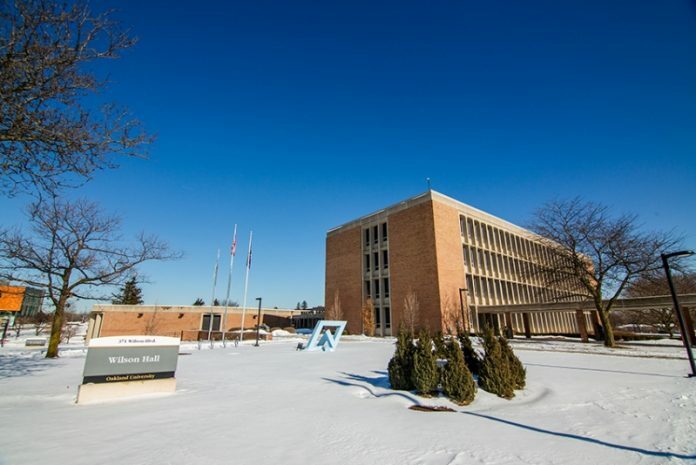 Oakland University in Rochester Hills plans to expand Wilson Hall. The $20.5-million project was approved by the board of trustees on Thursday, and construction costs will be covered by bonds, general reserves, and university debt reserves. The development, to be designed by Detroit-based Albert Kahn and Assoc., will include a 54,000-square-foot renovation and a 40,000-square-foot addition. Nearly 70 percent of the space will be dedicated to student activities. The building currently houses administration for Meadow Brook Theatre, Meadow Brook Art Gallery, classrooms, and offices. Project SUCCESS (Support of University Community by the Creation of Enhanced Student Services), the university’s plan to consolidate and enhance student services, is transforming Wilson Hall and North Foundation Hall into a home for programs, classrooms, tutoring, first-year advising, a disability center, student business services, financial aid, and potentially a testing center. Wilson Hall, which was originally built in 1965, also will be the new consolidated site for admissions, including a new welcome center and administrative offices. In the last six years, Oakland has constructed, renovated, and expanded buildings including the Oakland Center, Hillcrest Hall, the Engineering Center, Oak View Hall, and the Human Health Building. The college’s enrollment has climbed by 59 percent since 1998. Oakland’s master plan reports that classroom space utilization on campus is above national standards and beyond recommended practice. The plan calls for continual expansion in the amount of campus space in square feet per student. “Renovations and new construction on OU campus since 2012 are responses to ongoing enrollment growth,” says James P. Lentini, provost. In December, Oakland received approval of $30 million in state funding for the South Foundation Hall reconstruction. Costs for the project will be covered by state funds and a previous bond issue. The 55,000-square-foot hall and 25,000-square-foot expansion will reconfigure space to increase the number of available classrooms. The building is one of the original campus structures and opened in 1959. The school has more than 19,000 students.